Most tension headaches are caused by trigger points. These knots or mini-spasms cause pain to travel in predictable patterns to different areas of the body, often nowhere near the tight area. X marks the trigger point. The red areas show the pain pattern related to the trigger point. A trained massage therapist will ask about the location of your headache pain. This information can then be used to map back to the pain-inducing trigger point. 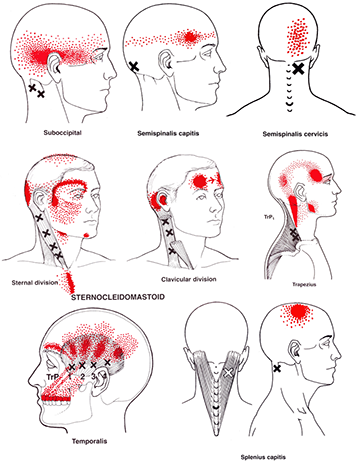 It is a connect-the-dots use of signs and symptoms in order to plan an effective, headache-relieving massage therapy treatment. As the muscles containing trigger points are treated, your headache pain may be temporarily recreated. This is a sure sign that the massage therapist is focusing on the right areas in order to relieve, and possibly prevent a reoccurrence of, your head pain. The nagging pain of a tension headache doesn’t have to be suffered for long. Relief is available in the hands of your massage therapist.